The Samaritan keyboard for OS X 10. * and Windows 2000, 7, and 8 is a resource I produced for my own research using the excellent free software package Ukelele for OS X, and Microsoft Keyboard Layout Creator for Windows. View his layout and installation instructions here http://rid.olfo.org/doc/il.txt and download his layout (the same file minus *.txt extension) here: http://rid.olfo.org/doc/il. Uri DeYoung has created a Samaritan Hebrew font that works with the standard Hebrew UNICODE layout. Depending on the project or use, this may be a highly useful option as the font may be changed back/forth between Hebrew/Samaritan. 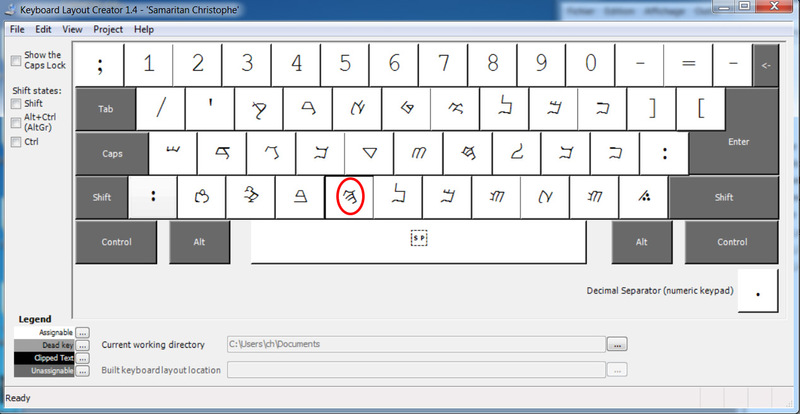 According to DeYoung, he added “most of the vowels to the Hebrew keyboard map so that you can enter them with a standard Hebrew keyboard.” Download DeYoung’s font here: http://rid.olfo.org/doc/Hebrew-Samaritan-New.ttf. Originally, I made the OSX package available in case any students, scholars or members of the Samaritan community needed to type in Samaritan Hebrew on OS X. Given that the Samaritan community numbers approximately 760 (410 in Holon, Israel and 400 on Mt. Gerizim in the West Bank), and there are only a few hundred Samaritan scholars in the world, I expect that this won’t be very many people; however, please do contact me if you find this package useful or have any suggestions or comments. I am also happy to talk with anyone else interested in creating a keyboard layout on OS X for similar size language groups. Learning to type in another language is a fun and enjoyable way to learn a new script. Based on interest and the work of many listed below, I’ve updated the page to include Windows and Linux solutions. 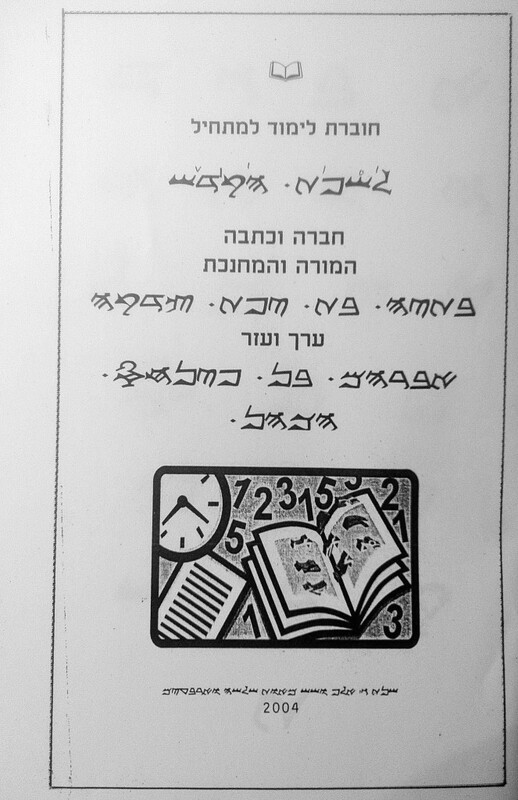 Samaritan Aleph Bet authored by Zolovon Altif. Mt. Gerizim, West Bank. May, 2012. SHIFTing to the second layout, I have included all of the major vowel and punctuation symbols found in the UNICODE Consortium’s standard for Samaritan (http://www.unicode.org/charts/PDF/U0800.pdf). In a future version of this keyboard design, I may change the placement of consonant markers, vowel signs, and punctuation. Before you begin the installation, please verify that your “root” account is active and has a password. If your root account account is not activated on OS X, then you will not be able to execute the sudo command. Apple has detailed instructions here on how to enable the root account. Before you install the Samaritan keyboard, please also download and install the free Ancient Fonts package here: http://sourceforge.net/projects/culmus/files/ancient_fonts/. 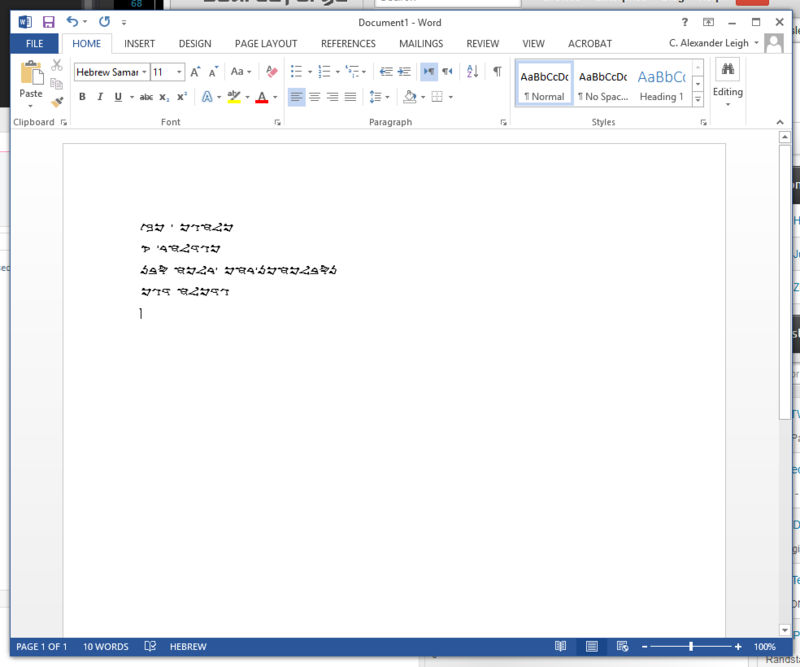 Download, extract, and click on the “Hebrew-Samaritan.ttf” font. Click the installation button to install this font. I also recommending installing the excellent opensiddur.org font package here: http://opensiddur.org/2010/07/unicode-compliant-and-open-source-licensed-hebrew-fonts/; however, be aware that the file is large [50 MB] and may take a moment to download on slower connections. 1. Download the *.tgz file here: http://rid.olfo.org/doc/samaritankeyboardosx0.40.tar.gz. Decompress the .tar.gz file and then extract its contents Samaritan.keylayout to your main Desktop. 2. From the Applications -> Utilities directory, open Terminal.app. 3. From the prompt in terminal, type: cd /System/Library [hit enter] then type, cd Keyboard* [hit enter]. sudo cp ~/Desktop/Samaritan.keylayout [hit enter and type in administrative password]. 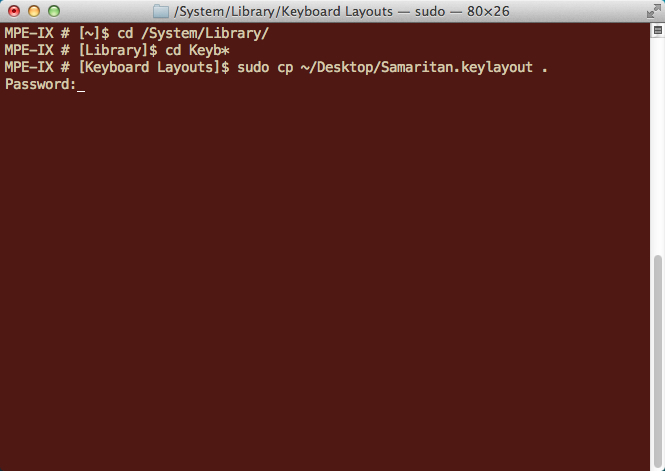 If this step using the Terminal app is too difficult or confusing, you can also click on Macintosh HD -> System -> Library -> Keyboard Layout, and then drag Samaritan.keylayout from your Desktop to the Keyboard Layout directory. You will also be prompted for a password. 3b. NOTE: For OS X 10.6 and 10.7*, you may also need to install the Samaritan.keylayout to Macintosh HD -> Library -> Keyboard Layouts. 4. We’re ready to install the keyboard. Before installing, be sure to reboot your computer. 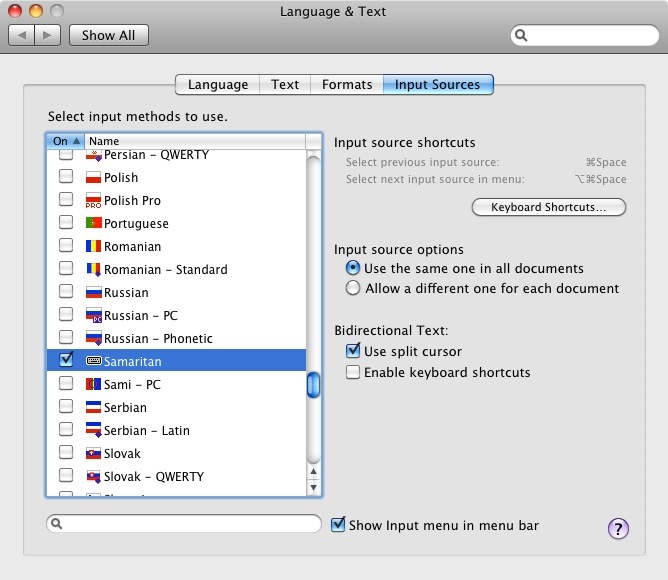 Once your computer has restarted, go to System Preferences -> Language and Text -> Input Sources and click on Samaritan. 5. In the top right hand corner, you can now click on the country flag and select Samaritan. You’re ready to type in Samaritan! 6. You’re now ready to type in Samaritan! If you encountered problems with the installation, first double check that you copied Samaritan.keylayout to both /Library/Keyboard Layouts and /System/Library/Keyboard Layouts. 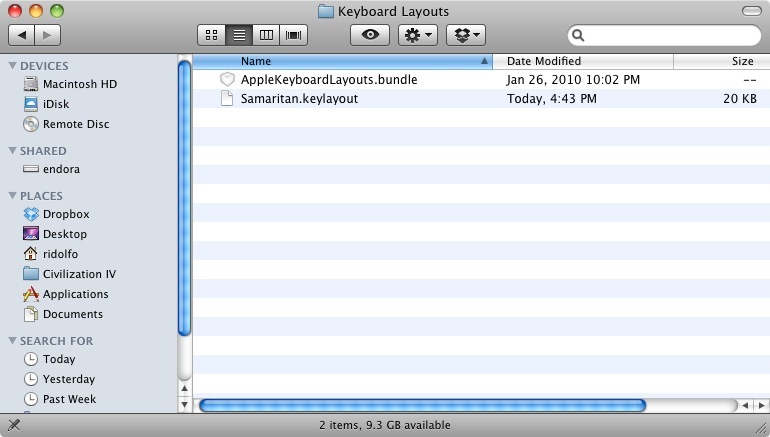 The uncompressed size of Samaritan.keylayout should be 20K. If it’s 4K, then the file is likely corrupt and you should try to re-download the file. If after reinstalling and rebooting Samaritan does not appear as an option under “Language and Text Preferences,” feel free to contact me and I’ll see if I can help out. 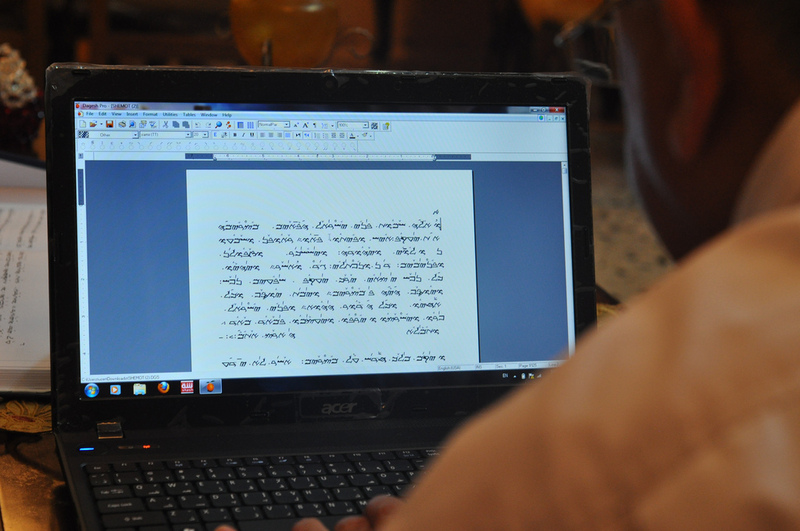 As Samaritan Elder Sameer Yousef Sarrawi demonstrates below, there is already Samaritan font support on Windows. 1. 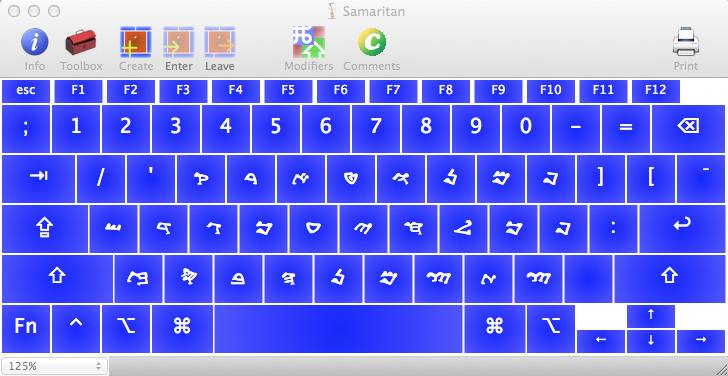 Before you install the Samaritan keyboard on Windows, please download and install Yoram Gnat (z”l”)’s Hebrew-Samaritan.ttf font with diacritical marks here: Hebrew-Samaritan.ttf. 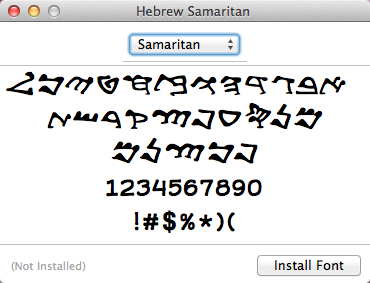 After downloading, click on the “Hebrew-Samaritan.ttf” font and install it on your computer. 2. 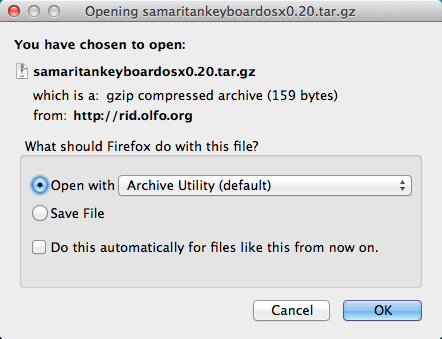 Download and uncompress the installation software from http://rid.olfo.org/doc/samaritankeyboardwindows1.01.zip. Note: version 0.20 did not include support on Windows for diacritical marks. Thanks to the work of Christophe Silvestre at http://www.crealpes.fr, they are now supported in the current release. Install the appropriate free font (see above). Run the installation software in the uncompressed directory. 3. After installing the font package and Samaritan keyboard software, you will need to reboot your computer. 5. Test out your new Samaritan keyboard!